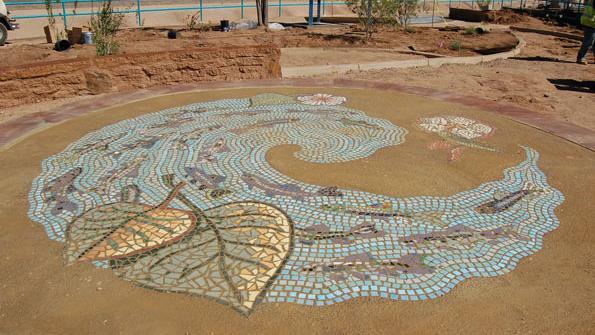 Albuquerque’s Public Art Urban Enhancement Program recently completed a project called “Rain to River” that complements the restoration of a stormwater channel through the northeast part of the city. The artwork, made with a process called LithoMosaic, is incorporated along a large stretch of the Hahn Arroyo, which funnels water from city streets to the Rio Grande River. The $2.2 million Hahn Arroyo Rehabilitation Project, managed by the Albuquerque Metropolitan Arroyo Flood Control Authority, was completed in December and involved the removal and reconstruction of a section of the concrete-lined channel. The project aimed to improve water quality, provide recreational opportunities with walkways and bicycle paths, and use water-harvesting techniques to irrigate the landscaping. “Rain to River” called on a local arts organization and 160 volunteers to contribute ideas and skills to create public art that would be incorporated into the newly redesigned channel. Facilitated by Project Coordinator and Lead Artist Nan Masland, several community workshops were held to design and assemble the art. The LithoMosaic materials, developed by Robin Brailsford and licensed by Lithocrete, were installed by Bomanite Artistic Concrete, a licensed LithoMosaic installer. The $100,000 project was funded by the city’s Public Art Program, which sets aside 1 percent of city construction funds for art. “The resulting artwork was so successful, and community enthusiasm so strong, that the Public Art Program is looking into developing another project using the same materials and community-workshop approach,” says Sherri Brueggemann, Albuquerque Public Art Program manager.